In the Document Design section, administrators can upload a logo for order documentation. Click on the Upload button, browse your computer, select your logo, and click on Open. In the Document Content section, use the Document Content dropdown to select the document you would like to edit. When designing the sales documentation, administrators can choose to display product thumbnails by checking the "Show Product Images" box. Do not check this box if you wish to hide the product images. 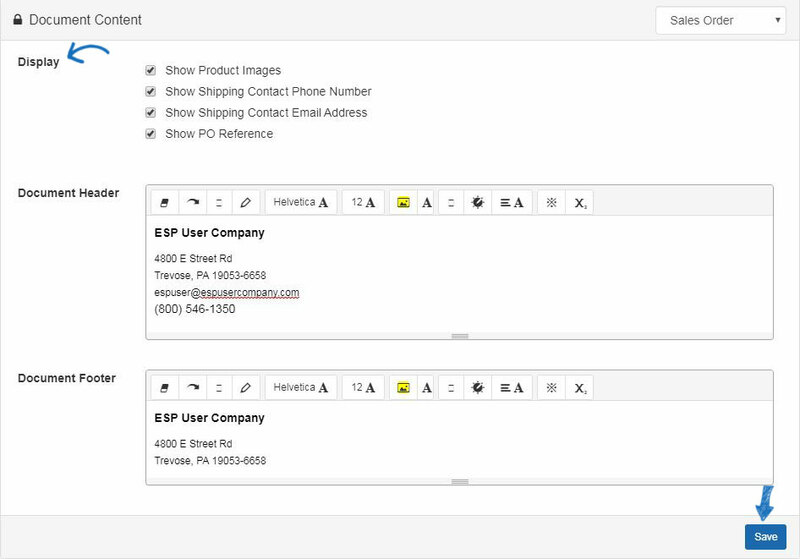 Use the header and/or footer boxes to customize this information for company Sales Orders. Enter the information you would like to include within the appropriate section and then use the available toolbar to format it. Invoice, Acknowledgement, Quote, and Packing List will also contain the option to show the CPN (coded product number) or Product Number. Select the option you would like to use. When you are finished, click on the Save button at the bottom.